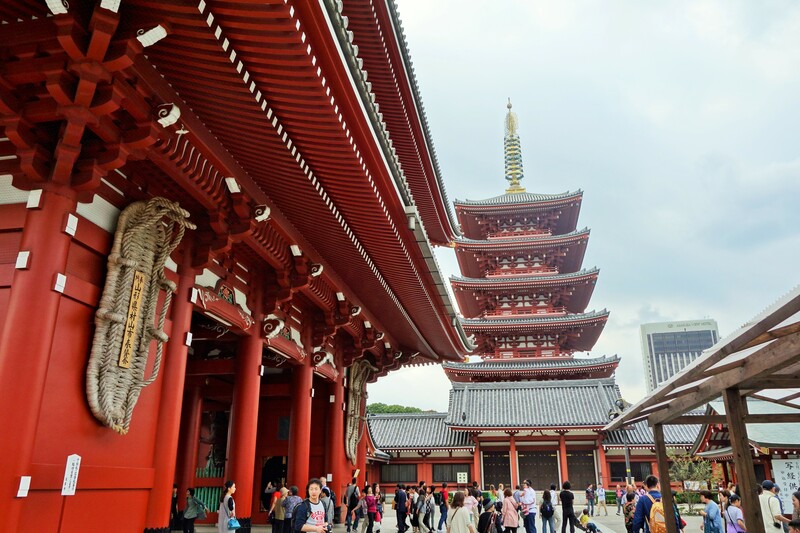 Tokyo time part 1: Senso-ji Temple and Tokyo Skytree. My second day in Tokyo (after a very pleasant flight from Hong Kong but a stressful first day of settling) allowed me to have my first insight into ancient Japanese spiritualism and religion via a temple visit (which I hope to experience more of in Kyoto) and gave me the chance to see 360 degree views of Tokyo, lit up and twinkling at night from an almost bird’s eye viewpoint (350m high). My friend and I awoke on day 2 in Tokyo with the intention of having an early start but in reality, we didn’t venture out into Ikebukuro (where we are staying) until late morning. 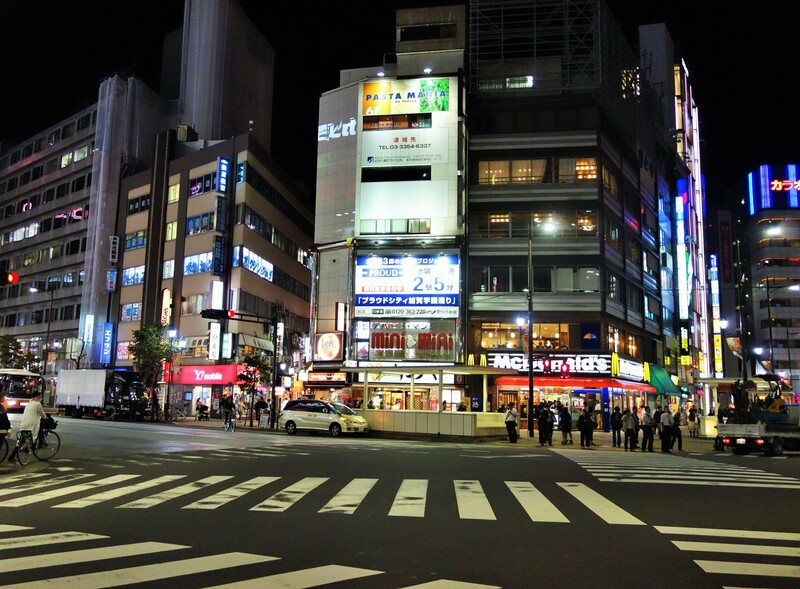 Ikebukuro at night- this commercial area of Tokyo encompasses the “work hard, play hard” philosophy. Here you can see it lit up at night. Our primary form of transport that day would be the train network; we had brought a JR pass in advance (for up to 7 days, standard price of £165.50, free trains on the JR network and some buses). 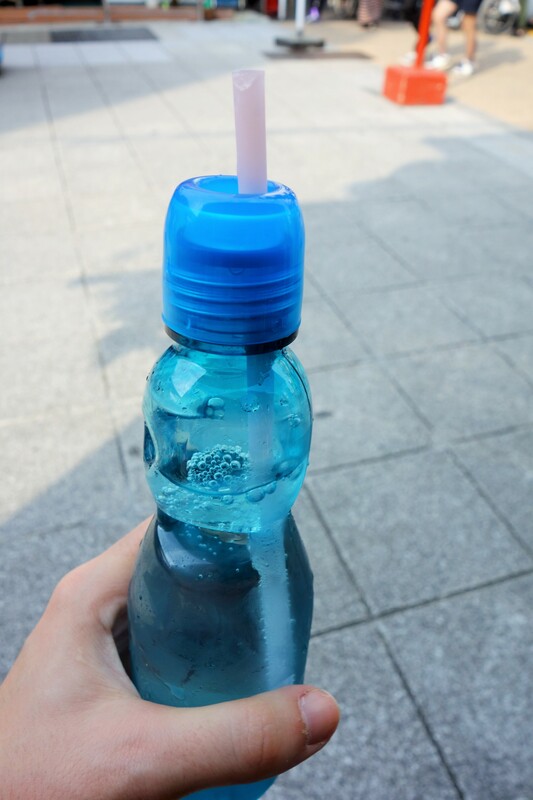 This was also an important purchase for us since we knew it would cover the cost of our train travel to Kyoto (our second destination in Japan). 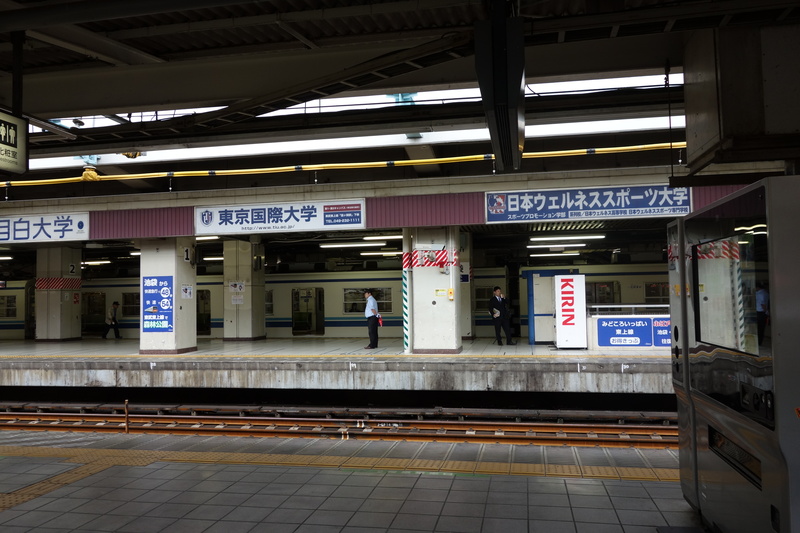 The first port of call was Asakusa, and to get here, we took the Yamanote line to Ueno station and then had to buy tickets to travel on the Ginza line (since this is part of the subway system, not the JR network). 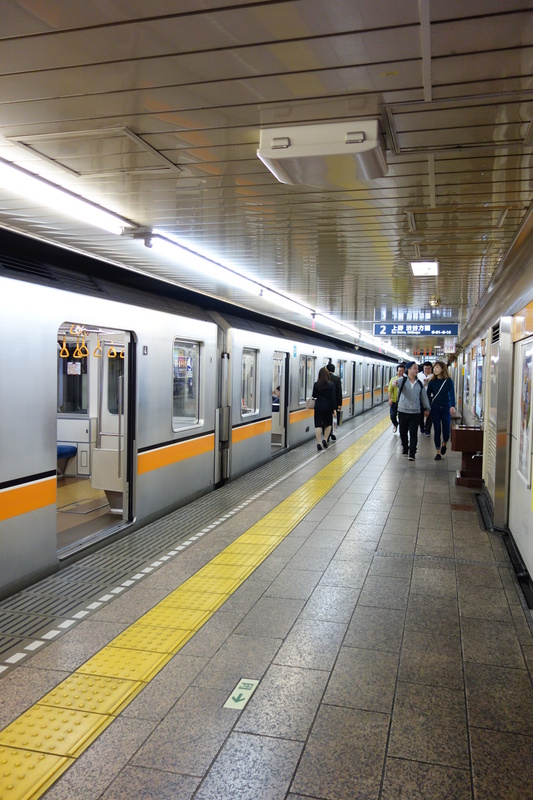 *note, if you do have a JR pass, you can get a shuttle bus to and from Tokyo Skytree in Asakusa to Ueno station, which eliminates the cost of buying a metro ticket- we discovered this whilst in Asakusa*. But enough on trains, we had a short straight walk from the station to get to the Senso-ji temple. 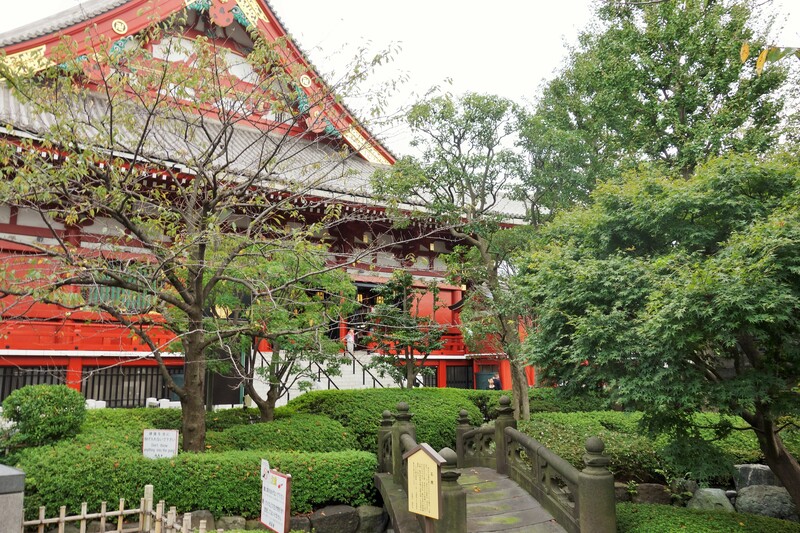 The temple itself is Tokyo’s oldest temple, known to the people of Japan as the Asakusa Kannon and attracting over 30 million visitors per year. 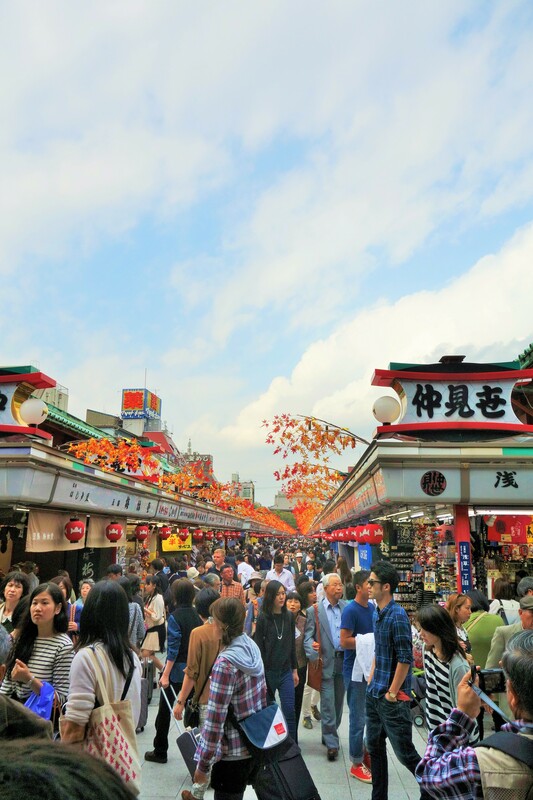 Walking through the arch, you experience a riot of colour and noise as market stalls selling items as diverse as rice-crackers wrapped in seaweed, toys pertaining to superheroes and childhood and traditional Japanese-style fans and tea sets line the streets. Upon approach to the temple; shop stalls become slightly more tourist-focused. If you look up, you can see decorations which seem to resemble tree or tree branches (maybe they are real, I’m not too sure), resplendent in shades of peach, fuchsia, lemon and crimson. 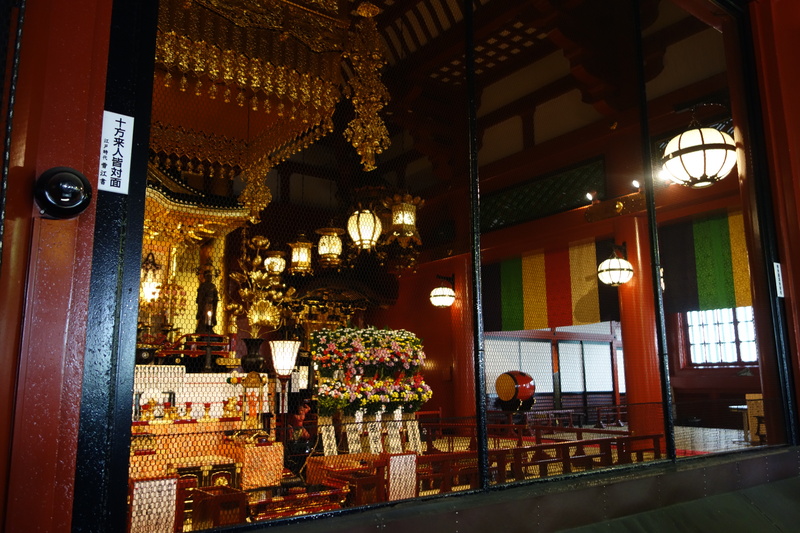 Prior to entering the temple, you walk through another arch (red and gold) and soon come across an urn, with incense smoke rising urgently and weirdly, almost elegantly, and the opportunity to buy incense sticks from a stall to the right. 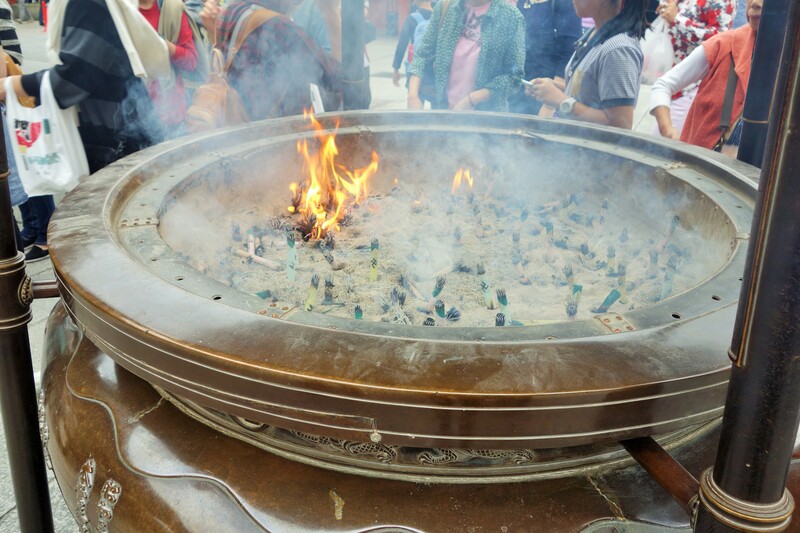 The purpose of the incense (reputedly) is to be a method of purifying the surroundings, bringing forth an assembly of buddhas, bodhisattvas, gods, demons, and the like. 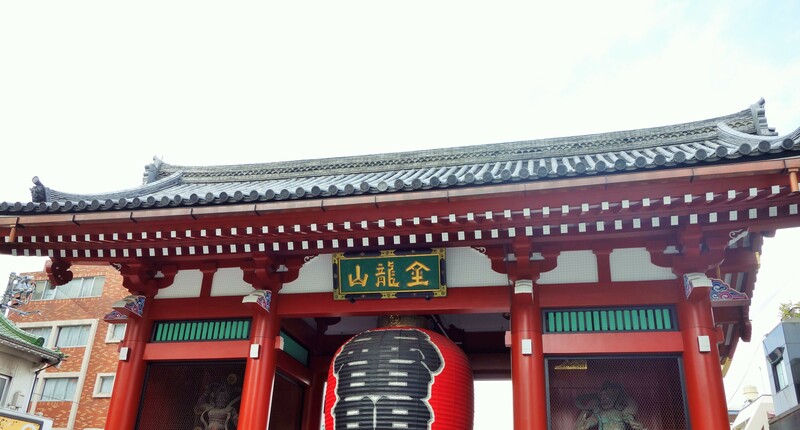 Entering the temple, you can throw money into a ridged box and say a prayer. It is also possible to light a candle. Since photos are allowed, below is a snapshot from inside of the temple. 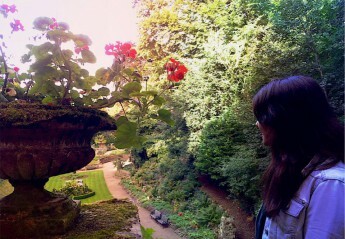 The temple gardens were also beautiful, and my friend developed a new obsession (see below). 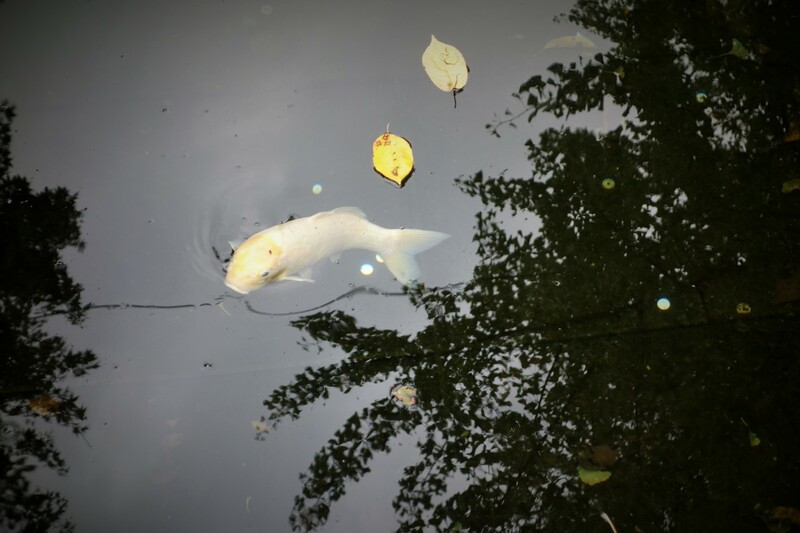 The temple gardens The obsession- a loved fish nicknamed “Diem”. By the time we reached the attraction, the city had crept towards darkness and my hunger levels were at an all time high (being vegetarian in Japan is not all that easy- a blog post about that might be coming soon amongst other things). So we decided to have a look around to find a place that I was able to eat at. Eventually, we found a fusion café in Tokyo Skytree town (my friend had eaten fried chicken in Asakusa earlier) and since the staff were so polite and obliging (this seems ingrained in Japanese culture), I was able to eat spaghetti with soy sauce and seaweed. 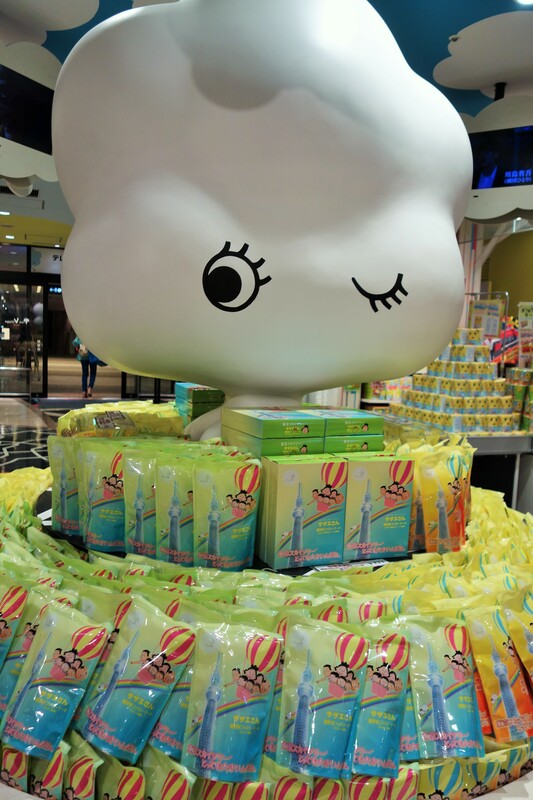 Skytree itself exists within a shopping village, and shops there are either cute, quirky and full of anime references or high-end/high street clothing and accessories brands. 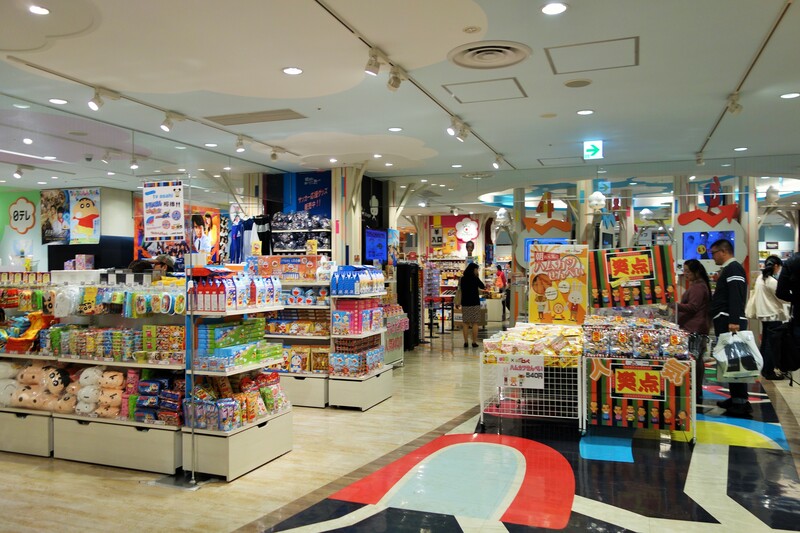 There are also food courts and restaurants. It spans over roughly 8 floors, with an east and west wing and a centre point. 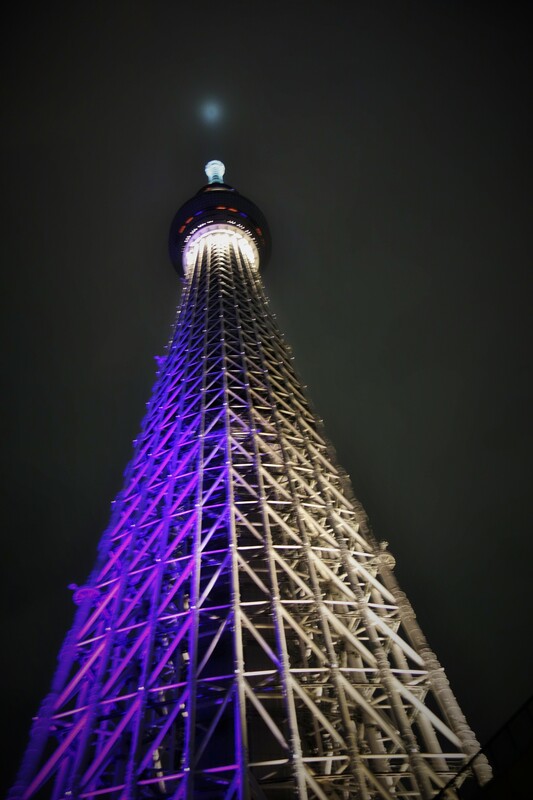 Post-food, we went to the fourth floor to access the Skytree tower. 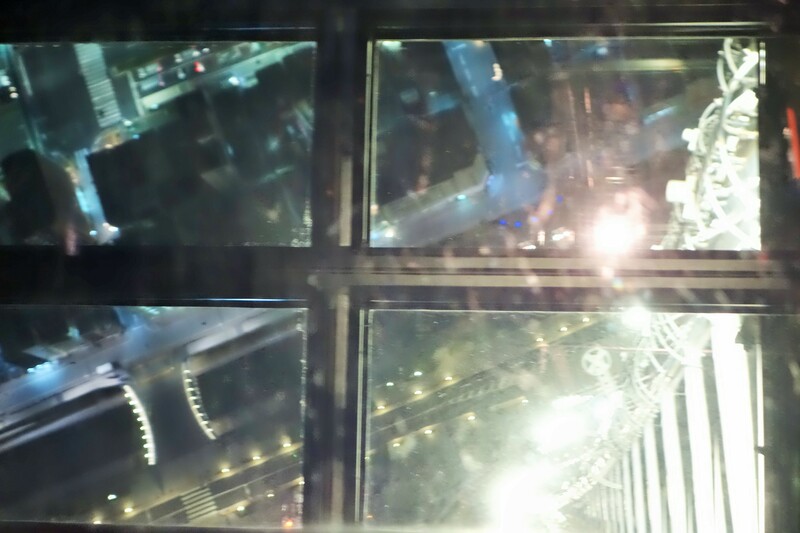 The lift elevated to us to 350m high ridiculously quick, so much so that my friend (who’s not crazy about sudden changes in height) did not experience any inertia. 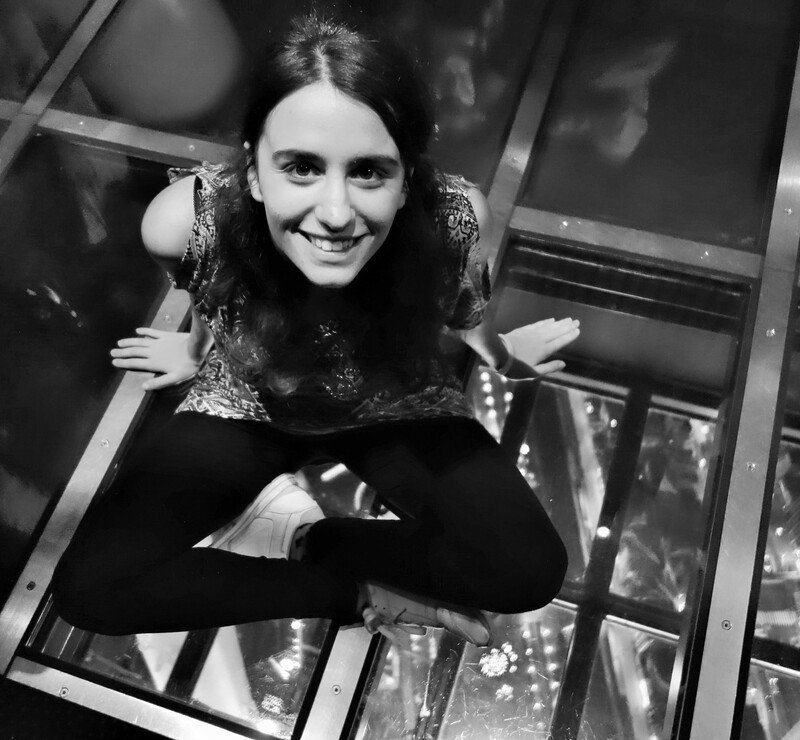 I’m also seriously proud of my friend (who suffers from vertigo) for standing on a sheer glass floor (with the drop from that height visible beneath it). In the end, he may have left Skytree feeling tired, and I may have felt energized, but both of us thought Skytree was an incredibly worthwhile thing to do. 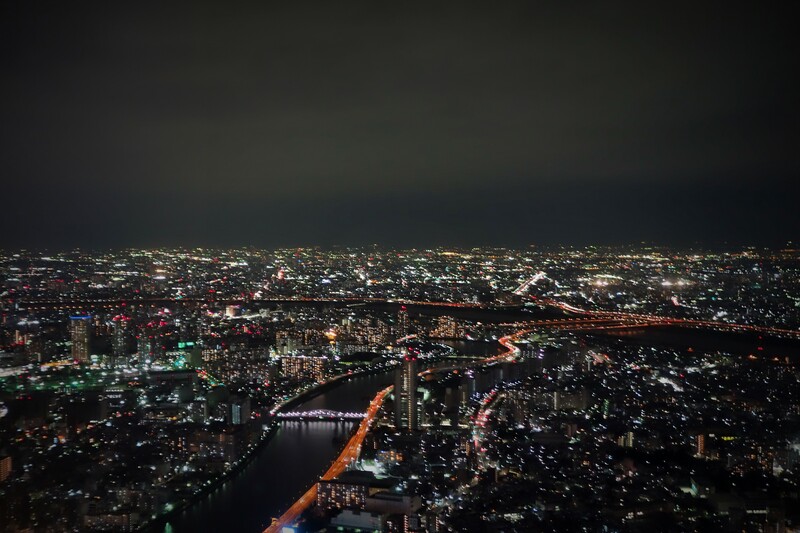 At 2060 yen, it may have been more expensive than Tokyo tower (which is where we initially planned to go and is located in Minato, Tokyo) but in my mind, it is well worth the cost. The views are mesmerising, staff are so sweet and cheerful and it was a lovely way to end a really good day in Tokyo.